One thing that I find so inspiring in South Africa are the countless people who do and participate in miraculous activities day-in-and-day-out as they strive to make their community better. In working for the Anabaptist Network in South Africa, my wife and I have the honour of meeting different people all around the country and listen to the different ways these people, these normal people, do extraordinary things; often risking their own comfort, their own well-being, and their own security in order to help others. They demonstrate day-in-and-day-out an alternative way of being; a way of being that seeks the well-fair of someone else over their own; a way of being that serves others rather than themselves; a way of being that strives towards peace and justice, not just for themselves but for everyone. It is a different way of living. Why do I say that this is a different way to live or a different way of being? I say this partly because we are regularly encouraged to focus on ourselves, our own well being, and our own happiness, rather than on someone else. We see this regularly portrayed in T.V. commercials where happiness and success is depicted as getting the keys to the car we always wanted, growing one’s business in order to afford the luxurious life, where bigger is better, where success means power, where power means influence, and where influence means progress. The focus tends to be on the self: securing one’s own success, power, and influence. Throughout the Bible, however, we find God embodying and asking us to embody a different method, one that challenges the assumption that success, influence, and power is gained by focusing on oneself. In fact, God’s method often turns these assumptions upside-down. Through a variety of sermons and meditations, Sider and Villegas bear witness to a grace that disarms our guardedness and makes room for us to fall into the love of God. Preaching becomes a dispossessive practice, as each person is invited to give and receive God’s transforming power. The proclamation of the gospel, Villegas and Sider say, should display the priesthood of all believers. us, the call to preach belongs to the whole congregation and its conversation rather than to the lone preacher and her (or his) sermon. Presence: Giving and Receiving God draws on the Mennonite tradition of the Zeugnis (“conversation”) to explore how the preached Word echoes through all of our voices. The book includes some of the posts that Isaac has posted here over the years. Congratulations, Isaac! This weekend I was at Laurelville Retreat Center in Mt. Pleasant, Pa., participating in "Renewing the Story: Anabaptism and Mission for Today," a gathering organized by the Anabaptist Missional Project. The Mennonite had an article about this group of young adults a few months ago. On the first evening of the gathering, founding member Matt Krabill introduced some of the history of the group. 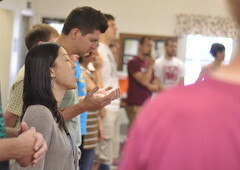 They first met together as a group in November 2009 in Harrisonburg, Va.
"We noticed that we were predominantly Anglo, male and seminary students, and that this wasn’t ideal for our goal of being a church in mission and so its something we want to change," said Kraybill, speaking of this first meeting. "We were paralyzed by the fact that we weren’t diverse, but at the same time we didn’t want to not talk." Anabaptist Missional Project (AMP) has had two regional gatherings since then, as well in Elkhart, Ind., and Lancaster, Pa., respectively. Kraybill also shared a list of issues that have come up through those meetings. Mennonite identity in light of "newer membership"